Wildlife communication can be elegant and alluring; consider the intoxicating scent of a budding flower, the music of the dawn chorus, or the graceful mating dances of many bird species. But these beautiful behaviours hide a dirty secret: Just like humans, other organisms can be devious, and sometimes they wish to mislead. They may try to obscure their presence altogether with camouflage; they may use mimicry to convince other individuals they are a different species or perhaps even an inanimate object; they may even tell outright lies. Deception should benefit those practising it, but it is often costly to the animals being tricked, from lost time or resources such as food, through to a greatly increased risk of death. 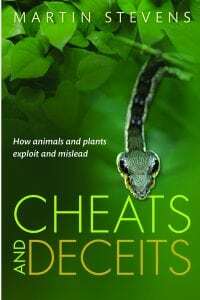 This book is about how deception works in nature and how it evolves…Ultimately, this book is about what deception can tell us about how species interact with one another, and the processes of evolutionand adaptation. So begins a riveting journey through an extensive catalogue of deceptive behaviours that are seen in nature. The reader learns, for example, about predators that trick their prey into approaching dangerously close, plants that facilitate reproduction by pretending to be mates of pollinating insects, and vulnerable animals that use displays to seem threatening to would-be attackers. Indeed, as these examples suggest, the vast majority of deception falls into one of only three broad categories: obtaining food, avoiding being eaten, and reproduction. The magic of the book is how it reveals, and revels in, the diversity to be found within each of these types—the many variations on a theme that result when you factor in differences in habitat, mode of communication, relatedness of the deceiver and victim, and other constraints found in the environment. 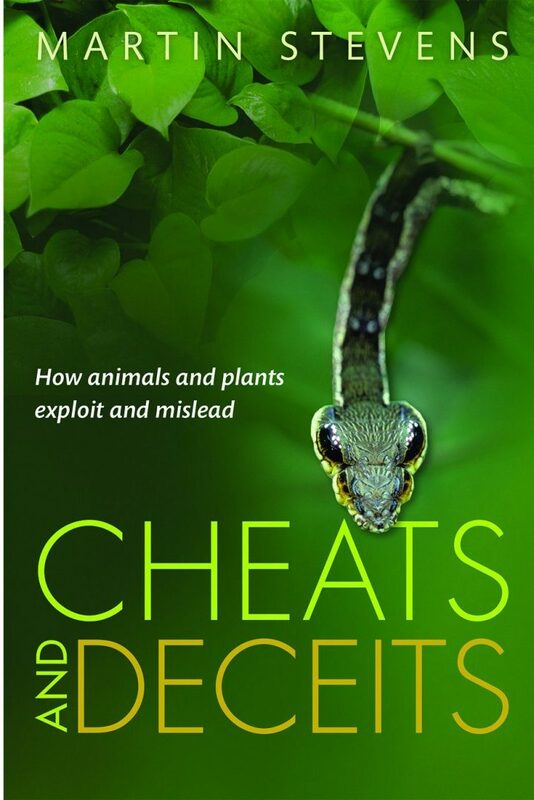 Cheats and Deceits is one of those rare books that can be appreciated by both a scientific and a lay audience. This is not because Stevens oversimplifies his explanations and descriptions, but because he has such a clear and engaging style. One of the most appealing aspects of Stevens’ writing is how he takes care to define scientific terms and describe the methodologies used to observe, explore, and test hypotheses about the fascinating behaviours described here. The author acknowledges pioneering researchers by name and academic affiliation and cites liberally, thus making it easy for readers to track down more information on any of the studies discussed in the volume. Many of the book’s 69 figures include photographs of experimental setups and testing equipment; here, the scientific process is not something that is glossed over, but instead is placed front and center so readers can get a sense of the incredible work required to find scientific answers. The book could easily have been a literary cabinet of curiosities—full of amazing and engaging oddities, but lacking real educational value. However, Stevens takes care to contextualise his case studies so that readers also learn more broadly about how and why animals communicate, what types of characteristics can provide information to other individuals, and how and why these intricate behaviours might have developed to begin with. He is particularly careful to explore the “economics” of the behavioural transactions he describes—the costs and benefits for both the deceivers and the deceived, and the intricate balance that allows such behaviours to persist over time. 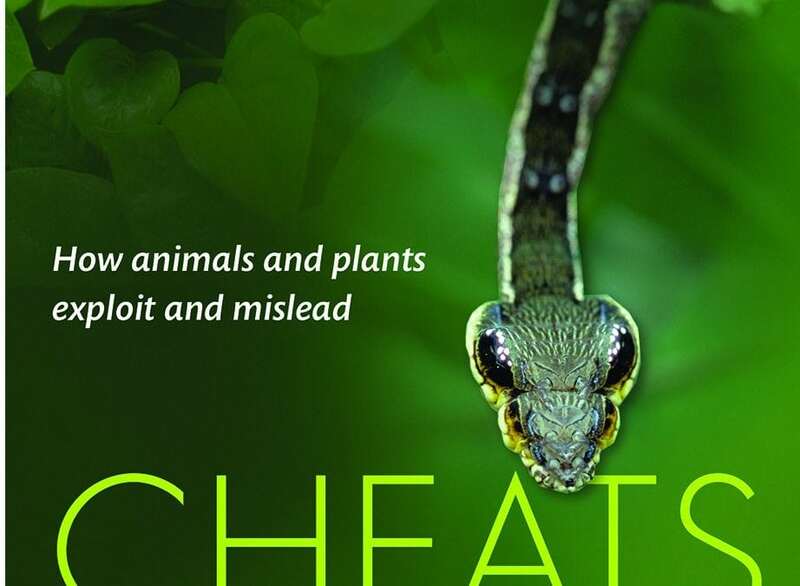 Thus, Cheats and Deceits is not just a useful introduction to one particular realm of animal communication research, but also an excellent and engrossing way to learn about natural selection and evolution in general. …that deception takes place in a way that is most salient to the animals being deceived, with regard to their sensory apparatus, and using our own perceptions to judge this can be misleading, either missing the sophistication of deception because we don’t perceive it properly, or even perhaps thinking the deception is not very good because it arises in areas in which our senses are superior to those of the animals being tricked. By allowing readers to sense the world through the eyes/ears/noses/feelers of a wealth of other species, Stevens shows not only that we can be easily misled by the signals we do experience, but also that the world around us may contain many more signals than we are even capable of perceiving. It is a stunning realisation that reminds readers just how impressively adapted our fellow animals are—even if they are sometimes cheats and deceits.